Find it difficult to quit diazepam on your own? How can you come off this powerful benzodiazepine safely? More on what to expect during diazepam withdrawal and how to overcome fear of detox here. Is diazepam doing you more harm than good? If you experience difficulties quitting, you can definitely benefit from professional help. More here on what withdrawal looks like. We’ll review the withdrawal protocol and give you some insider information about recovery. Then, we invite your questions in the comments section at the end. We love feedback from our readers! In fact, we try to respond to all legitimate questions with a personal and prompt reply. A sober life is worth it! Diazepam withdrawal is a set of physical and psychological symptoms that occur after you quit taking diazepam. It can often provoke symptoms of anxiety, insomnia, and inner restlessness. Who goes through withdrawal? Every person who has developed physical dependence on diazepam will likely experience uncomfortable symptoms after discontinuing this drug. Diazepam withdrawal is not a joke. It can be extremely challenging. Some symptoms of withdrawal may even manifest and be confused with mood disorders or mental health issues. So, if you have attempted to quit diazepam on your own before but were unable to succeed due to the severity of withdrawal effects…keep reading. In the following sections, we outline what withdrawal feels like, how long it lasts, and how you can manage it safely. Withdrawal occurs because the brain and body adapt to the intake of psychoactive drugs. In this case, diazepam interacts with the central nervous system as a depressant. When metabolized, diazepam slows the brains responses down and creates calmness, a state similar to peace and relaxation. But when you take diazepam regularly, the brain has to adjust by “speeding up” certain functions to accommodate for the chemical imbalance. And when you stop taking it, your body – which has been compensating by speeding up its responses – doesn’t know the difference. In other words, withdrawal symptoms occur when you stop taking habit forming drugs because your body has become adapted to receive them regularly. So naturally, when diazepam is no longer present, your brain needs a period of readjustment to the new chemical state. Withdrawal symptoms linger until you receive your regular, daily diazepam doze or until the body readjusts on its own. 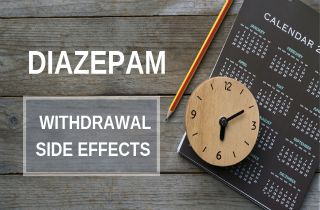 In fact, withdrawal symptoms occur during the period during which the body starts to normalize and becomes used to being clear of diazpeam again. Q: How does using diazepam change the way the brain functions over time? A: There are two main outcomes of daily dosing of diazepam: dependence and tolerance. Dependence – As explained above, regular diazepam users become drug dependent after a period of several weeks. When a person regularly uses psychoactive drugs, the body adjusts to the presence of the substance and relies on it for normal functioning. This condition is known as “physical dependence”. When you abruptly stop taking diazepam you expose your brain and body to a “shock”. The “shock” is withdrawal. During withdrawal, the nervous system struggles to get back to a state of normality. Tolerance – Tolerance is another expected consequence of chronic diazepam use. People who use diazepam build up a tolerance to this drug after repeated use. Tolerance simply means that your body responds less to original doses. In this way, people who use diazepam for several weeks or longer begin to need larger or more frequent doses to achieve initial effect. In the end, tolerance manifests as increasing amount or dose frequency. No. Not all cases of dependence develop into addiction. And not all cases of addiction present with symptoms of drug dependence. Basically, when your need for diazepam becomes more psychological than physical, you could be addicted. Physical dependence is an expected outcome that doctors plan for. Physical dependence is predictable, easily managed with medication, and is ultimately resolved with a slow taper off diazepam. But if you continue to (ab)use diazepam, levels of tolerance can gradually increase. Eventually, your body’s ability to maintain balance can deteriorate and your dependence will reach a higher level. In some of these cases, dependence can transform into another condition called “addiction”. Addiction is a chronic, neurobiological disease characterized by the compulsive need for a drug. It happens over time with habitual use and abuse… and may or may not be accompanied by physical dependence. 1. Main signs of drug dependence: Dependence can be recognized by tolerance (need to increase diazepam doses) and withdrawal symptoms that manifest upon significantly lowered doses or abrupt cessation. 2. Main signs of addiction: Addiction manifests as behavioral change(s) caused by the biochemical processes in the brain after continued diazepam abuse. How can you know if you’re addicted to diazepam, or not? Basically, you go through withdrawal and see if compulsion to use continues to exist, or not. A person who is drug dependent will not crave diazepam after withdrawal. A person who is addicted to diazepam will crave diazepam and continue to use it, even in the face of negative consequences. continued use of diazepam despite harm to health, social, or work. physical or psychological cravings for diazepam. impaired control over diazepam use, dose amount, or frequency. increase in diazepam doses without a doctor’s OK.
using multiple sources (often illegal) to get diazepam. People who admit that they need help are truly one step ahead of the game. You can get the help that you need in a safe and effective way. Reach out for help by calling us at 1-877-968-6062. We understand addiction. We can help you identify medical help suited to your personal needs. Symptoms of diazepam withdrawal are different for each person. This is because withdrawal intensity depends on many factors such as a person’s general health, age, unique drug metabolism, and levels of dependence. You may not experience all of the possible symptoms, but you need to be prepared for a range of symptoms when it comes to getting off a powerful benzodiazepine such as diazepam. The fact is that diazepam withdrawal can be severe and unpleasant. But, there are quality residential facilities that employ medically trained staff who can make your withdrawal process as smooth and comfortable as possible. Why wait in fear? Call us to start down the path of recovery. You are not alone! The frequency and length of diazepam use. The level of drug dependence and tolerance. A person’s gender, age, and unique reaction to drug metabolism. The simultaneous presence of other mental illness(es). The most intense diazepam withdraw symptoms usually resolve in 5-7 days, but can last up to 3-4 weeks after last diazepam use. However, PAWS (post acute withdrawal syndrome) can linger for several months after you initially go through withdrawal. Some people report that PAWS from benzodiazepines last from 3 to 6 months or even years after acute withdrawal. The brain needs time to repair neurocircuitry changes it has undergone during diazepam addiction. Still, there is little consensus on exactly how much time may be needed, and the duration of PAWs varies from person-to-person. Diazepam withdrawal begins in the hours after you’ve taken your last dose and your body expects another. Acute symptoms of diazepam withdrawal usually fade after the first few days of detox, while more persistent symptoms of diazepam withdrawal can last for several weeks. The whole diazepam detox process lasts about 6-8 weeks after your last use. As a benzodiazepine, diazepam withdrawal seems to oscillate between highs and lows. One week you may feel healed/cured and the next week your condition might get complicated. Therefore, a benzodiazepine withdrawal can be unpredictable with multiple fluctuations during the process. The first week of diazepam withdrawal. The first week of diazepam withdrawal is the hardest. You’ll face sleep disturbances and frequent waking up during the night. Expect some aches and pain. People feel the greatest need for diazepam during their first week of withdrawal. After this week, your condition should stabilize a bit as a result of medical supervision. The second week of diazepam withdrawal. The symptoms of diazepam withdrawal often peak in the second week after quitting. The full-blown symptoms of withdrawal start taking effect during this time and usually include muscle pain, sweating, and tremors. Weeks 3-4 of diazepam withdrawal. The third and fourth weeks after last use generally serve as an adjustment period. Your condition should stabilize during this period and your body return to normal. Insomnia and anxiety may still bother you, but most of the major storm has passed. The fist step of ending the vicious circle of diazepam addiction is facing your fear of withdrawal and asking for help. It’s never too late to turn your life around. If you failed several times on your own, trying to withdrawal from diazepam with professional help may be your lucky charm. Reach out to our trusted recovery specialists to get help right NOW. Once you decide to get help, you can regain control over your life. FIRST: Enroll into a rehab facility. SECOND: Go through medically supervised diazepam withdrawal. THIRD: Start walking the road of recovery either with the help of an inpatient or an outpatient program. The key to quitting diazepam while trying to avoid uncomfortable withdrawal is reaching for professional help. There are specific medical treatment that our treatment consultants will explain to you. Just call for FREE. Calls are confidential, and our advisers are here for you 24 hours a day, 7 days a week with all you need to know about diazepam withdrawal and treatment programs. What is the “best” way for you to withdraw depends on how much and how often you used diazepam, as well as your individual health state. 1. TAPERING UNDER DOCTOR SUPERVISION: When come off diazepam after using it for a certain period of time, it’s best to go see your physician before you begin the withdrawal process. When you visit, expect to undergo a physical examination and to submit blood or urine for testing. Then, if your doctor considers it safe for you to go through withdrawal at home, you will receive a tapering schedule and reduce doses gradually until you can finally stop diazepam completely. Your physician should stay available to you during the process in cases of emergency. Doctors can also prescribe you some medications or suggest over-the-counter meds for short-term management of symptoms. Intake and evaluation during which the staff at the facility will gather information about drug abuse history, previous attempts to quit, financial resources for treatment ,and your system of support. Intake and evaluation can be viewed as an information exchange that is the basis for your individualized treatment plan. Expect a physical exam, an interview/questionnaire process, and drug testing. Monitoring and support during strong cravings, crises or other health complications. Inpatient facilities provide 24/7 care and support. Is Rehab appropriate, or not? It depends on your specific case. People who deal with the psychological need for diazepam can greatly benefit from a stay in rehab. In fact, treatment at a detox clinic is naturally followed by rehab. After successful detoxification, you can either proceed to an inpatient or outpatient treatment program. Usually, you’ll remain in a 30, 60, 90+ days or longer program, depending on your progress. If you have any questions, call us to get in touch with a trusted treatment consultant who can provide you with everything you need to know about diazepam withdrawal, addiction, and its treatment options. Can I Cold Turkey Off Of Diazepam? Quitting diazepam cold turkey is NOT recommended and can be very DANGEROUS. This is why you should never try go cold turkey on diazepam. This method of discontinuation can lead to coma and other fatal outcomes. Instead of risking your life, seek professional help. ALWAYS SEEK PROFESSIONAL HELP WITH DIAZEPAM WITHDRAWAL. But, if you must quit diazepam without a taper, those who are best suited to go cold turkey off diazepam are those with lower dependency rates. Seek specific protocols from your prescribing doctor. Generally, when you have a lower dependency rate on diazepam, your body doesn’t have to compensate as much for lack of diazepam in the body. Additionally, it less risky to face a diazepam withdrawal when there are no co-occurring medical problems to compromise the withdrawal process. For people with drug issues, fear is a common emotion. In fact, fear can keep us stuck in the same cycle of drug abuse. Why are we so afraid of quitting? People with a diazepam problem fear quitting because of the physical and psychological discomfort experienced during withdrawal. Not only do we need deal with emotional pain and underlying anxiety, we try to avoid the cravings and the state of feeling physically and emotionally ill …at all costs! In other words, withdrawal itself can be a big barrier to quitting. Physical dependence and addiction to diazepam are manageable conditions. Call to undergo a medically supervised diazepam detox TODAY. We are available 24 hours a day for your convenience. People have different motives for using diazepam. Some use it out of curiosity and pleasure, others to relieve anxiety, to manage alcohol withdrawal, or prevent emotional pain. Whatever the reason, repeated use and abuse eventually lead everyone to addiction. BUT, this viscous cycle does not have to go on forever. There is a way out! YOU can beat your inner battle by choosing not going through the process of withdrawal alone. Professionals can help you with the struggles you are facing. Break out of denial. You can’t keep ignoring a drug problem forever. Face the consequences of your actions. Realize and admit to the damage that diazepam has inflicted over your health, work and family. With this honesty, you are ready to get move forward. Educate yourself. Read, research, ask questions, watch testimonials…. Delve into everything you need to know about diazepam withdrawal. This way you’ll will know what to expect from the process, and how to prepare yourself for the next phase. Find the best rehab for you. The process of withdrawal may be hard and uncomfortable, so the safest way to quit diazepam is by finding a medical detox clinic that can assist you in the process. You CAN become drug-free. To turn your life around, you need honesty and courage. Keep in mind that 23 million people have managed to get clean from drugs and have been living drug-free for years. You can, too! Addiction treatment programs work. If you find that you cannot stop using diazepam on your own, a rehab can help get you back on track. Reputable rehabs use evidence based treatment modalities like talk therapy and medications to help people achieve sobriety. One of the most important things a rehab will do is to help you find your inner strength – to identify your true, authentic self.What are some of the other benefits or rehab? Moreover, a professional rehab can help you overcome the fear of withdrawal, and lead you through the whole process with constant care. Medically supervised detox guarantees SAFETY. Further, detox and emotional support are performed by professionals who have training and expertise to help you quit diazepam for good. life. Remember, addiction transforms your personality, making you believe that you are weak, when, in fact, you are strong and capable of living a sober life. For assistance in finding the perfect treatment facilities for diazepam addiction, call our no-cost hotline as soon as possible. I am on 6x10mg a day but I’m petrified to stop,roderick63smith@icloud.com age 55 years 30 years abuse. Hi Roderick. Yes, it can be difficult and scary to stop, but what’s even scarier is living with addiction for so many years. Enrolling yourself in a rehab program is the safest and the most comfortable way to overcome addiction. With the right treatment you can achieve a lot. I start take 5 mg diazepam in October but I want to stop and I star to take half and after quarter and I stop now but I feel strange is normal ? Hi Ana. I suggest you consult you prescribing doctor so s/he can create a personalized tapering schedule for you. I have read your site and found it really helpfull but im still getting mild hallucinations after 4 weeks is this part of coming off? Hi Craig W. The hallucinations may be a side effect from the withdrawal. I suggest you talk with a doctor about your your issue. I am going through withdrawal from diazepam. And I took gabapentin is this safe? This information answered every question I had and the information was clear, all inclusive and supportive. The symptoms listed were very helpful to me, in that they normalized what I have been experiencing. It is good to know that what I am experiencing makes sense. Hi Michele. We are glad that we have helped you. Stay strong, and keep up the good work! Hi, I’ve been kept on Diazepam over 20 years!!! Moved home to end my days in the mountains, 15mg a day dose, registered at the surgery, and was told I was being put on a reduction program, and this horrible doctor took 3mg away immediately, 1mg is dangerous!!!! Then over 3 years reduced to 2mg! And I have a black out, fit, seizure! Over the last 3 years I’ve felt ill night and day, I’m totally dependent and addicted to Diazepam! There is no way out for me, a life time of withdrawal, plus the Anxiety it was originally Perscribed for. Hi Hannah. I suggest that you change your doctor, if you are not getting the appropriate care. Also, talk with a psychologist or other specialist, and whenever you face suicidal thoughts, call on the National Suicide Prevention Lifeline at 1-800-273-TALK (8255). At this moment I’m experiencing withdrawal symptoms from Diazapan and am very agitated.I had been on 5 mgms 3 x daily for about 3 months ( maybe longer ( as prescribed by my doctor. After a period of time I asked my Doctor if I could take something else instead of the Diazapan and he prescribed Amitriptiline instead.Unfortunately, not realising that I had run out of them,I put in a repeat prescription for Amitriptiline at my local pharmacy which for some reason took a while before I was able to get them.When they did eventually arrive at the pharmacy,they had set 3 boxes of Diazapan instead of Amitriptiline! When I phoned the pharmacy, the pharmacist just said that it was pro because it was on a regular repeat system.I then put in another script for Amitriptiline which took a while to get.,during which time, due to anxiety,I had to take the Diazapan to help with it as I had nothing else.Suddenly tonight I am experiencing withdrawal symptoms!! Agitation and poor sleep ,keep waking up etc and general irritability.Please advise,kind regards,Linda. I stopped taking Diazepam 10 days ago. I wanted to leave a comment because when I looked for some relief online before quitting there were few reassuring posts to ease my mind. First off I experienced little to zero withdrawals. The reason I am not exactly sure is because I quit a 3 year suboxone habit 45 days ago. Those are extreme withdrawals and last for quite a while. I wanted to quit everything at once so I quit the valium as well 10 days ago. I didn’t notice anything. I was on Valium for 3 years. Started at 15mg and have been on 2.5 for the last year. I was taking about 2mg when I quit. Not everybody has horrific withdrawals and I just want that to be out there to avoid people not quitting them, because I almost didn’t after everything I read online. I hope that helps someone else. Ta. Not sure wat te do. Afraid to stop n den start again. Moreover, if you still experience any problems, call the helpline you see on the website to get in touch with a trusted treatment consultant. The info provided is excellent. I have been taking diazepam on and off when I get off alcohol to counter the effects of alcohol for a couple of days not exceeding 5mg/day nocte. Now that I have given up both I have most of the symptoms you have given. Unfortunately, there are no known rehab facilities for rehab in the country I am living in. The Psychiatrists are rare and far between. Besides they are so money minded they will put me on something I cannot get out of. The next option for me to take this challenge on my own. As you have rightly indicated, this is the second week and the symptoms are peaking out and I will have to put up with them with some meditation. Thank you. I have been taking diazepam for 15 years cut down to 1 5mg a day but when stress bad 2 or 3 a day. Have decided to stop them altogether. 24 hours since I had any is this safe.